Memorial Day - Cards for Heros Blog Hop! | Midnight Crafting Midnight Crafting: Memorial Day - Cards for Heros Blog Hop! Welcome & Thank you for stopping in! Memorial Day Weekend is upon us! For many, it's three days of fun in the sun and welcoming summer with that fist BBQ. It's great to enjoy yourselves, but keep in mind that Memorial Day is also about remembering soldiers that have given the ultimate sacrifice for our country. In honor of Memorial Day, Cards for Heroes put together a nice tour of card making blogs! If you'd like to start at the top o' the hop click here! We're all posting patriotic cards that we've made to send to the troops. To Make this birthday card I used my fabu template for making 80 cards from one Stampin' Up! Simply Scrapping Kit, and yes - I made 80! I still have some last minute finishes to them - plan to add a label to the back with the Cards for Heroes website, and some more inside greetings, but then I am shipping them all off to CFH. I have been learning more about this great group since I found them on Twitter, and as I was reading thru the website I found that Birthday Cards for Men are in high demand! Using the Best Ever Kit I was able to make about 1/2 Birthday, and 1/2 Congratulations cards. The birthday ones I did more in the red and blues, and the congrats are done mostly in the green and blues. I figure the congrats cards would be good for friend to friend cards for positive news or accomplishments. I really hope that our troops and their families will enjoy these cards!! I encourage everyone who reads this to get involved with this organization in whatever way suits you: send blank cards (handmade or store-bought); send an AnyHero letter/card; send a donation to help pay for shipping! Even a Dollar makes a Difference! Your next hop: Paper Fun By Lysa is a great stop - full of some really creative cards! Make sure you look around and checkout Lysa's awesome Useful Links! Enjoy!! Before you hop, please take a second and post a comment for me! Cards For Heroes will be awarding prizes randomly chosen from all comments left, so be sure to leave a comment at every blog you visit. Happy Crafting & Hope to see you again! Wow, that is a TON of cards you made! Great job, I'm sure the troops will love them! Thanks for sharing this great event. ohmigosh! you've made so many card and they all look great! 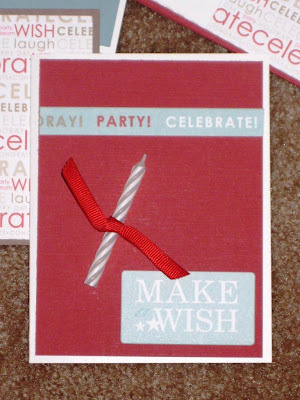 Such a cute idea to put a candle on the card--love it! Wow!! You've sure been busy and ALL the cards look fabulous! WOW, check out all those cards--this is GREAT! You're an inspiration! Wow, I think you went above and beyond with all the cards you made! They are too cute! Happy Memorial Day! What amazing cards. I know they will be greatly appreciated. Great cards.. So many.. thanks for be so involved.. WOW!!! I ABSOLUTELY love the added little candle on the front. What a GREAT idea.... you are amazing!!! Such fantastic cards! Our heroes will love them! That's a lot of cards....You've given me incentive to make more! Cute cards. Fun blog...Happy Memorial day! Wow, thanks for sharing your cards! Wow you have been busy - I'm sure they will love getting all those cards. This is such an exciting event! Wow thats a lot of cards, you are amazing for doing this! Beautiful cards!! Keep creating and giving!! These are fantastic - LOVE the candle card. Wow, that is a big set of cards you've created! Thank you for sharing them with us and with our soldiers. Wow, you have been busy! Your cards are cute and I know the soldiers will love and appreciate them! Thanks. 80 cards!!! Oh, my goodness. You have just put me to shame with my one little card...guess I had better go and catch up! Wow! What a great contribution you have made to our troops. Thanks so much for sharing! Phew! I have made it this far! I am blown away by the talent and heartfelt sentiments on everyone's blog! Your cards are beautiful and I am sure they will be appreciated! My DH is currently deployed and he had just complained to me the other day that he waited in line for the makeshift PX the other day to find only graduation and birthday cards! He claims he "made" me a card instead.. cannot wait to receive that! LOL! - anyway, that said I know these cards are appreciated! thanks for your time and energy! WOW! Your on a roll! Fabulous cards. Thanks for participating in the blog hop! WooHoo 80 cards! Thanks for sharing with CFH and we hoppers! What an impressive group of card! Thanks for participating in the bloghop and contributing cards. Wow! Look at the amazing cards made! OMGosh!!! That is a huge pile of cards that you made. You are awesome and so are your cards, just beautiful. Those cards are really going to make someone happy. I loved your quote at the end of your post! Card making here I come! Using the candle was a super cute idea! Love the card, thanks for sharing. Great job of those cards. Thank you to all those who serve or have served. We remember! First of all, STUNNING cards!!! I'm really interested in this template of yours and would love to find out more about it if you have the time. Thanks! Great group of cards!! And thanks for the idea about the labels. You are amazing!!! I know that all of the troops will appreciate your hard work. I absolutely love the candle on the card-- very clever!!! I can't believe how many cards you created! Great job! You have been busy making wonderful cards! TFS! You have been busy!!! Great cards. It's amazing what you have created! As a military wife, please let me say thank you for what you are doing. It's so good to know that there are others thinking of our loved one's when they're in harms way. What a wonderful way of showing your appreciation! It is getting very hard to make comments but the quote from Muhammad was so wonderful I wanted to say something. All of you are very special-God bless you. Love all the cards. Great job. Thanks for sharing. Whoa! That's a bunch of cards!! And they all look fab! Way to support the troops. Have a wonderful weekend. Holy moly look at all those cards....you set that bar high :) Great job! You've made a lot of cards Angela, your rock. WOW- what an incredible gift! All those cards! In addition to sending some cards, I'm trying to do my little bit for CFH. I have added a link to this blog hop and embedded the CHF youtube video on my blog. I hope it brings many more people to participate in this wonderful group. What a great thing all of you are doing for them! Super fun card with the candle! Very impressive assortment of cards you are donating. I appreciate all the time you have spent supporting this great organization. You have been busy! What wonderful cards, you are an inspiration! Thank you so much. These are great! Thank you for participating! Looks like you have been really busy! This will be my first time participating with CFH, my goal is the 25 + 2 challenge. Thanks for the inspiration. So many cards!! What an accomplishment. I can't imagine anyone NOT enjoying and loving the cards you send. They are fabulous! Thanks for the inspiration! Wow - that's a lot of cards - congrats on making them all! Thanks for sharing with us! WoW! 80 cards!!! fab job! Great cards! Thanks for supporting such a fabulous cause. Wow.. haven't you been the busy beaver. Thanks for helping us make this hop so successfuly, and for all of your support. Wow! What a huge bundle of cards. I love the patriotic colors!!! Thanks for sharing your talent. WOW...what a great bunch of cards. The families will love them. Thank you for making cards for our heroes. Well done on your card! I'm so impressed by how many cards you made all at once. An absolutely beautiful and loving way to use your talents. Whoa! Look at all of those cards. Great job! I love the candle idea. I will have to check that out. How can I find out about making 80 cards with that set of paper? Wow! 80 cards with one kit. I am glad I found this great blog on the hop. 80 cards! How wonderful of you!! WOW!! Congrats to you on all the wonderful cards you've created to support this cause!!! Great job! Card loot! Wow! 80 cards! That's awesome. I love the candle on the birthday card. Would be SO cute for a 1st b-day! Thank you and Happy Memorial Day weekend! that is a beautiful assortment of cards! WOW! wow 80 cards - that is so great! they will be so appreciated! The inspiration I'm getting seeing all this creativity on the bloghop is fantastic. That is A BIG BUNCH of cards you made - they're great! WOW!!! Thanks for sharing your talent with us!!! and thanks for supporting our troops with your card donation!!! What a great job you did with those CFH cards. Thanks so much for inspiring us! And wow so many cards I know the soldiers will appreciate them. Look at all of those cards! Good for you!!! 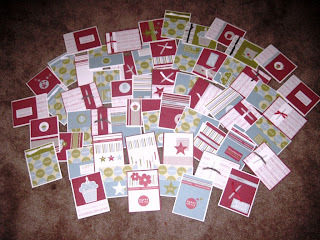 Wow, I am so impressed and inspired by the amount of cards you made! I have the hardest time with masculine cards, but you seemed to make a bunch of beauties! What a great bunch of SU cards you are sending over. I have a bunch left over from Sale a bration that I am going to put in with mine. Plus other cards that I have multiples of. What a great bunch of cards. Excellent cards, you made quite a bunch! awesome cards! Thank you for supporting our troops and CFH! Have a wonderful Memorial Weekend! Awesome stash to send to the troops! Thanks for supporting CFH. Love your card! Please keep on supporting CFH - they are such an amazing group. My husband is a Naval Gulf War vet. I am inspired by how all the bloggers support each other too! Have an amazing weekend. wow ---- that's a lot of cards!!! Thanks!! thanks for make all those cards... you should be so proud! I love the cards, and WOW did you make a lot! Great inspiration for everyone else, and me too. Love the quote at the end of your CFH post. Thanks for making all those birthday cards! How wonderful all your cards are! What an inspiration to get everyone involved. Wow, WOW!!! Congratulations on creating so many cards! Thank you for your participation and giving to CFH!! I must check into the template for 80 cards in one. A beautiful display of the cards. I love your card, I'm loving the hop too! Wow - that's a bunch o' cards! What a great idea. They look beautiful. You did great! What a huge contribution!! Two thumbs up!! Goodness! You made a ton of cards! What a great contribution. Thanks for your participation in the hop and for your support of our service men and women. Happy Memorial Day. Great card, I love the candle! Thanks for sharing making so many cards for our heroes. Happy Memorial Day! Your card is simply beautiful - and WOW - Look at all the rest! Thank you for your creativity and dedication to this great cause. Very pretty! I love it all! Thanks for supporting our men & women in service. Happy Memorial Day! So many cards! I plan on contributing also but don't know if I'll get that many made. Your cards are amazing! THey will be cherished! Thanks for doing the hop... this is so fun and inspiring! What a wonderful card; love the candle. Such an impressive spread of cards for the cause! Thanks for sharing. Great name-it's mine too-Angela but called Angie. Thanks for making all those great cards. I know they will be appreciated by the troops. Isn't CFH a wonderful org? awesome cards - love the candle idea!! Very nice card thank you for sharing. I am so enjoying visiting everyone. What a wonderful bunch of cards. I love seeing all the red, white, and blue together. Adorable cards! Thank you for all that you do for this great organization! P.S. Hope you don't mind if I leave an additional comment. Visit The Original Scrapbox and check out their product catalog and also please take a minute and cast your vote for me, my entry #257! I am in the running to win a scrapbook desk! What a FUN shot of all those cards you made! Thanks for your support of Cards for Heroes! We hope you had fun on the blog hop this weekend, thanks for joining in! Awesome idea to make so many cards from one kit! Can't imagine why this never occured to me. Perfect project for a club too! Thanks for sharing and for supporting CFH in such a grand way. What a great card! I'm really inspired by how many cards you made from one kit!! The candle on the card is a cute idea. Thanks for supporting our troops in such a big way. I love your card!! What a famtastic group of cards you have done as well!! You have done a great job in helping out our men and women in the service. Angie what a great job! I love the colors! I just started a BLOG awhile back too! Check it out!